The most beautiful crown for a tooth is, without question, all-porcelain or all-ceramic crown. With porcelain fused to metal crowns, there has to be an opaque layer put over the metal to block out its colour. This makes it impossible to have a translucent restoration that mimics the translucency of natural teeth. Only with pure porcelain or pure ceramic can you have such translucency.EXPERT-DENTAL is now using CAD/CAM (computer aided designing and milling) to fabricate all ceramic crowns and bridges. 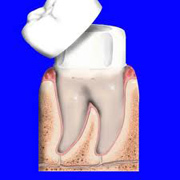 This is done by electronically capturing and storing a photographic image of the prepared tooth and using computer technology, to craft a 3-D design that conforms to all the necessary specifications of the proposed crown or bridge. After selecting the proper features and making various decisions on the computerized model, the dentist directs the computer to send the information to a local milling machine. This machine then uses its specifically designed diamond burs to mill the restoration from a solid ingot of a pre-determined shade to match the patient's tooth. These veneers are then processed in the laboratory under the direct supervision of Dr.Prasoon Shukla. This processing usually requires 7-10 days. The final porcelain veneers are permanently bonded at the second office visit.